Take off on an epic road trip through Ladakh, with a group of like-minded travellers for company. This roadtrip combines the best sightseeing around Leh with some of the most exciting adventures that this mystical land has to offer. You'll camp on the banks of the famous Pangong Lake, ride an ATV in the sand dunes of Hunder, go rafting in the Zanskar river, and camp on the banks of the gorgeous Pangong Lake. In addition, you'll visit Pathar Sahib Gurudwara, Shanti Stupa, Shey Palace, Diskit Monastery, Thiksey Monastery, and the 3 Idiots school. You'll also drive to Khardung La, the highest motorable road in the world. This is a fixed departure trip on the 10th August 2019. Please enquire with us if you are looking for other dates. 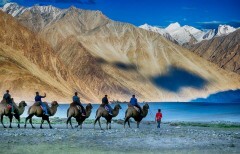 • Spend a week in the magical land of Ladakh. • Visit Shey Palace and Shanti Stupa. • Stand in awe at the foot of the towering 100-feet tall Maitreya Buddha at Diskit Monastery. • See the Indus-Zanskar sangam. • Visit Thiksey Monastery, Pathar Sahib Gurudwara, and other famous landmarks. Spend the day travelling to cultural landmarks and monuments around Leh. Starting in the morning, you'll visit the Hall of Fame, a war museum dedicated to soldiers of the Kargil War, the Pathar Sahib Gurudwara, an important Sikh house of worship, and the Sangam VIew, where the rivers of Indus and Zanskar meet. In the evening, you'll also visit the Shanti Stupa, a Buddhist landmark with colourful artwork and gorgeous views of Leh. Overnight in a hotel at Leh. Begin the return journey from Hunder to Leh. En route, you'll stop by the Diskit monastery, a hilltop house of worship with a colourful statue of the Buddha. After some time at the monastery, you'll return to Leh over the same route via the Khardung-La Pass. Spend the evening at leisure. Overnight in a hotel at Leh. Your road trip across Ladakh continues as you travel to the multi-coloured Pangong Lake. The 4-hr drive will take you over the Chang-La Pass, the third highest motorable road in the world. After driving over winding mountain roads, you'll reach the Pangong Lake, where you can sit by the shore and dip your feet in the cool water. As the sun sets over the Himalayas, you'll notice the water changing shades of blue and green with a blanket of twinkling stars overhead. Overnight in Swiss tents at Pangong Lake. Begin the return journey from Pangong Lake to Leh. En route, you'll stop by the Shey Palace and monastery, the summer palace of an erstwhile king of Leh. You'll also visit the Thiksey Monastery, a hilltop monastery with panoramic views of the Indus Valley. En route, you'll also stop by the Lotus School, featured in the popular Bollywood movie '3 Idiots', although entrance depends on the school authorities. At Leh, you'll engage in a thrilling session of whitewater rafting in the Zanskar River. You'll battle the rapids of the river and ride the waves with a paddle in your hand and a life jacket over your chest. Rafting is available only beteween 25 Jun-30 Aug. Overnight in a hotel at Leh. Drive from Hunder to Leh. You'll be accommodated in a hotel at Leh. Today's meal package includes breakfast and dinner only. You can have lunch at the hotel in Leh or at any of the eateries and restaurants en route to Leh, at your own expense. Drive from Leh to Pangong Lake. You'll be accommodated in Swiss tents by the Pangong Lake. Today's meal package includes breakfast and dinner only. You can have lunch at any of the eateries and restaurants en route to Leh, at your own expense.